Sometimes shake people up when I announce that Spain is one of my favorite food destinations in the world. People who haven’t been, and judge Spanish food by what’s available in the U.S., are vastly undervaluing the allure of food in Spain. From pork products, to fresh fish, to baby animals, to fresh olive oil…there are scores of things you can get over there that you simply cannot get over here. Here are my five favorite musts when visiting Spain. And they’re even better when enjoyed alongside a bottle of gorgeous Spanish wine, like Traslascuestas Ribera del Duero Roble 2015 or Cyatho Verdejo 2016. Without doubt, in my mind, the best Jamon Iberico of Spain (at about $150 a lb.) has the greatest Italian prosciutto by the tail. Spain wins this round, fo’ sure. Jamon forever! Fundamentally, the two hams have a different profile. At its best, Italian prosciutto (whether prosciutto di Parma, prosciutto San Daniele, or another Italian ham) has a soft,silky, velvety texture when sliced thin. Most Italian prosciutto is subtle in flavor (unless the ham has been aged 2-3 years, or more). Jamon Iberico from Spain, for starters, has a different color: dark purple rather than prosciutto-rosy. There’s more chew in the slices…and almost always a lot more flavor: porkier, cheesier, nuttier. Of course, the latter description makes sense for the highest-end Jamon Iberico, the Jamon de Bellota—which feeds on acorns, giving the ham a very special flavor. * What you’re looking for is ham from the Iberico pig, a breed with black nails. There are many other hams in the market from other kinds of Spanish pigs; they don’t measure up. 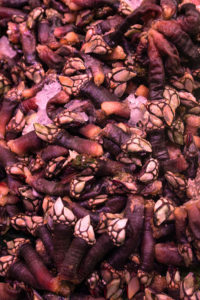 I am also obsessed with percebes—one of the weirdest-looking crustaceans you will ever gaze upon. They have a cluster of “feet” at one end, which on the right day looks something like stained-glass windows. A long, odd, color-shifting tube trails away from them, with a strong suggestion of phallic hoo-hah. When you break them apart to taste them, you will likely get a salty spray, very sea-like; when you start chomping, the sweet flavor is somewhere between lobster and real steamer clams. Typically, they are served room temperature, having been simply boiled or steamed within the last few hours. Good news! You can find them in the New York area; I have purchased some at Portuguese fish markets in Newark, NJ. They’re OK, but the ones I have had do not measure up to the sweetness and intensity of Spain’s percebes. OMG. Is there anything better in the whole carnivorous world than baby pig in Spain, crackling on the outside, so tender and velvety on the inside that the best restaurants in roast pig country cut your portion from the side of the pig with a plate? This is not available in the U.S., to my knowledge, because we do a better job of protecting our baby pigs. But if you’re in Spain, and feeling really wicked…I would definitely recommend having this experience a few times in your sinful life. 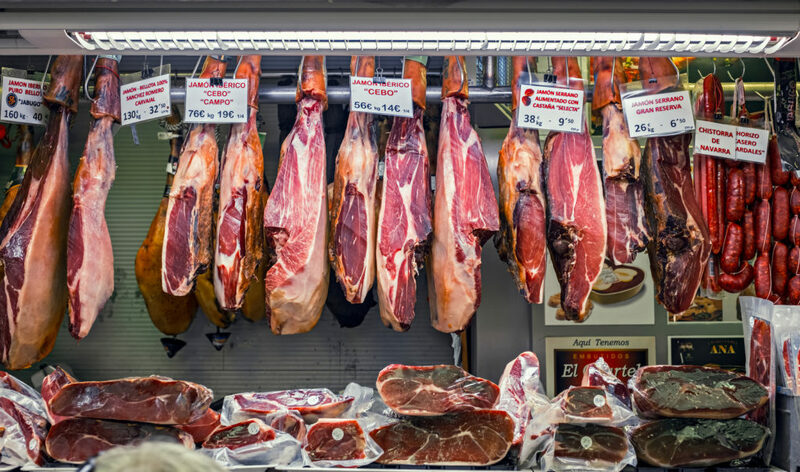 Cochinillo is all over Spain, particularly all over north central Spain—but if you’re hell-bent on pig, make a beeline for Segovia, about 45 minutes driving northwest of Madrid. Once there, forget the places that have become tourist traps…and head directly to Jose Maria, which has the most succulent suckling i’ve ever tasted, by far. And I was just there a year ago! There are many restaurants in Spain that allow you to choose between the baby pig, and the baby lamb…two of Spain’s glories. I always freeze; I never know what to do. If I’m not dining alone…the answer is at hand! However, there’s one area of roasting Spain where I don’t hesitate for a nano-second: the northern town of Aranda de Duero, in the wine region of Ribera del Duero. In this very special town, 30-40 restaurants exist only to roast baby lamb. 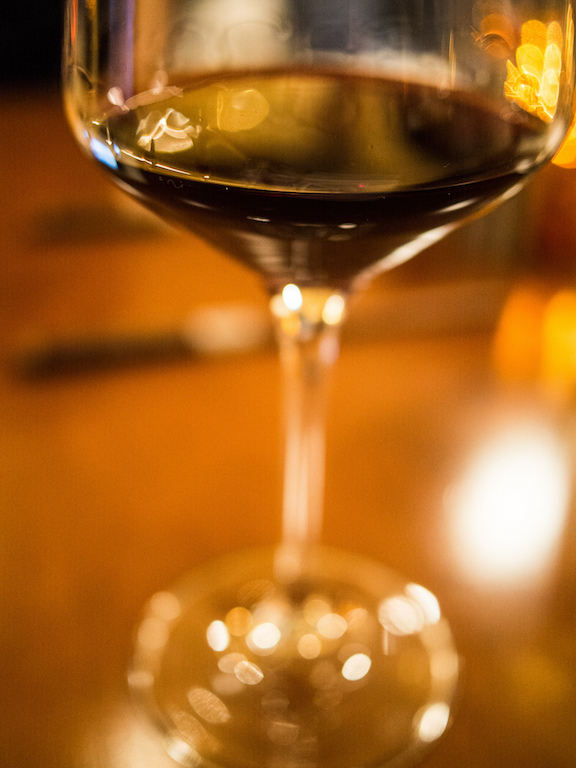 There may be a few other things on the menu, but most diners who are lucky enough to come here order only baby leg of lamb, salad, bread, and a heady bottle of local red wine (Ribera del Duero) to wash it all down. After all that…nuts? No, I’m not. Twenty years ago you could not get Marcona almonds in the U.S., and they were an absolute must for travellers to Spain. I say…they still are! Though fancy groceries have them now in the U.S…still, nothing beats the taste of a freshly fried Marcona almond at a winery in southern Spain, perhaps with some spicing (but usually not). 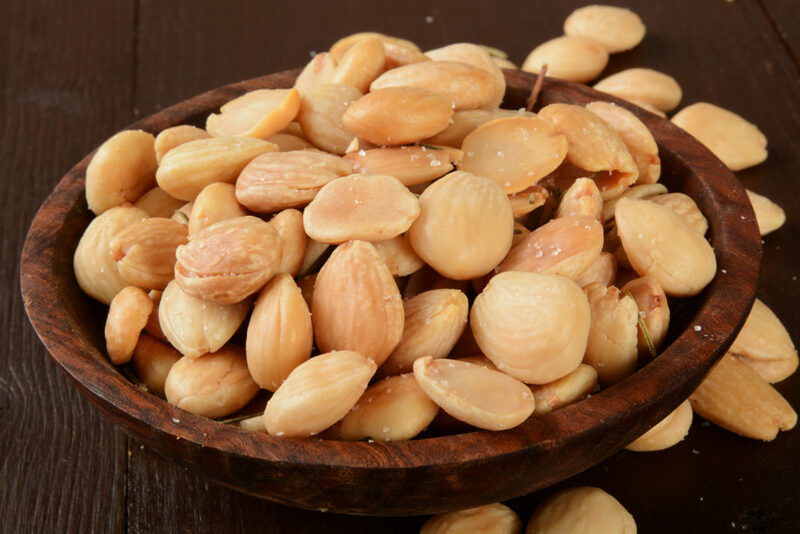 Marconas are botanically different from regular almonds: they are rounder and plumper. Taste-wise, they are more crunchy, they are “wetter,” and they have a bigger almond flavor. 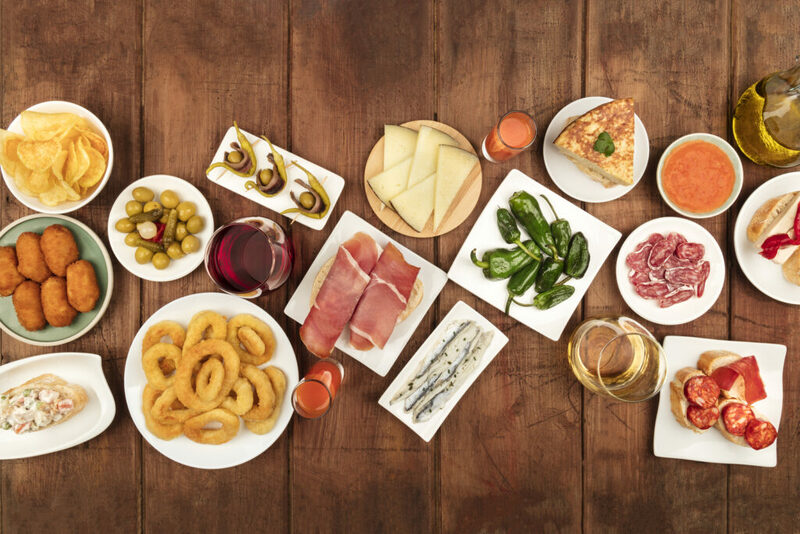 In Spain, even if I’m saving my appetite for tapas, seafood, roast meat, great cheese and fantasy desserts…I will start at 7PM with a few Marconas and a glass of Manzanilla, Fino or Amontillado sherry!